On this edition of No Holds Barred, host Eddie Goldman discusses the major fights in boxing held Saturday, May 4, and why, despite some brilliant performances, they were all showcase fights, and the fighters who were supposed to win all won, one way or another. 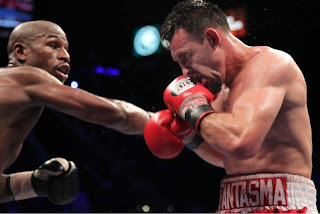 In those fights, welterweight and pound-for-pound king Floyd Mayweather Jr. won a unanimous decision over Robert Guerrero in Las Vegas, Nevada, USA, while heavyweight champ Wladimir Klitschko scored a sixth-round knockout over Francesco Pianeta in Mannheim, Germany. Also in Las Vegas, Abner Mares won by a somewhat controversial ninth-round TKO over Daniel Ponce De Leon, Leo Santa Cruz stopped veteran Alexander Munoz with a TKO in the fifth round, and J'Leon Love survived a knockdown to win a controversial split decision over Gabriel Rosado.